Afghan War Update 20170106 – Turkey extends its mission in Afghanistan, Taliban’s diplomatic offensive, Afghan women in a Trump world, meddling of Russia, CSIS report on Afghanistan, Marines back to Helmand, and more. Turkey Extends RS Mission. Turkey has been a key ally in the Afghan conflict. It heads up one of the Train, Advise, and Assist Commands – TAAC Capital – in Kabul province. In addition many of its military officers work in staff positions at the Resolute Support headquarters in Kabul. The Turkish parliament just approved measure to extend the Turkish Armed Forces in Afghanistan for another two more years. Read more in “Turkey Extends Its NATO Mission in Afghanistan“, Tolo News, January 4, 2017. Marine Advisors to Helmand. It appears that the Marines will make another entry into Helmand province. The province, long the domain of the U.S. Marines, Brits, Danes, and others was basically abandoned by the U.S. in 2014 when it shut down Regional Command Southwest (also known as TAAC-West) for a short time. However, events in the province has proven the departure was premature. 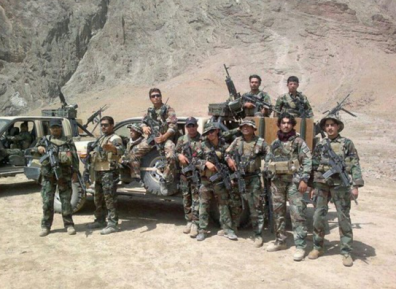 The 215th Corps of the Afghan National Army got crushed – and much of the province is now controlled by the Taliban. Last year the Army put in some SOF teams and some conventional army advisors (with support elements such as fires, MEDEVAC, loggies, intel, etc.) to help stem the tide. This spring Marines will take over the advisory effort from the Army. Read more in “Marines May Return to Afghanistan as Advisors This Spring”, Military.com, January 5, 2017. The Taliban’s Diplomatic Offensive. When President Ghani attained office in Afghanistan he adopted a three-tiered approach to diplomatically isolating the Taliban. In part, he was very successful. First, he repaired ties with the West; second, he created a regional basis for the rejection of terrorism, and third, he tried to negate the religious basis for the Taliban’s insurgency. The Taliban didn’t take this lying down and immediately started there own diplomatic moves to pull international support from the Afghan regime. Ahamad Bilal Khalil, a researcher at the Center for Strategic and Regional Studies in Kabul, writes about the dynamics of diplomacy in the Afghan conflict in “The Rise of Taliban Diplomacy”, The Diplomat, January 3, 2017. Afghan Women in a Trump World. The plight of the Afghan women has improved over the past 15 years but much work remains to be done. Funding by the United States and international community has been key in providing programs and ‘coaxing’ the Afghan government and security institutions in providing basic rights to women and integrating woman into mainstream society. But now we have the “Trump Era” which will certainly have an impact on Afghan women over the next few years. In which direction will this go? Heather Barr, a senior researcher on women’s rights at Human Rights Watch provides some insight in “3 important lessons behind the recent news emerging from Afghanistan”, Women in the World, January 3, 2017. CSIS Report on Afghanistan. Anthony H. Cordesman, a highly-respected observer and critic of the Afghan conflict, has provided an update on his perspective of the war in Afghanistan. The tone of the report is indicated in the lead sentence of the 84-page report – “The Trump Administration will inherit an under-resourced mess in Afghanistan when it takes office.” His report is entitled “The Trump Transition and the Afghan War: The Need for Decisive Action”, Center for Strategic & International Studies, January 2017. State Spokesman Kirby Spins Recent Russia-China-Pakistan Conference. Three countries recently held a conference to discuss peace in Afghanistan. Excluded were the United States and Afghanistan. This wasn’t exactly an event favorable to the U.S. or Afghan government but John Kirby, State Department spokesman, manages to put a good face on it. See “U.S. Welcomes Any International Effort to Help Afghanistan”, Tolo News, January 4, 2017.